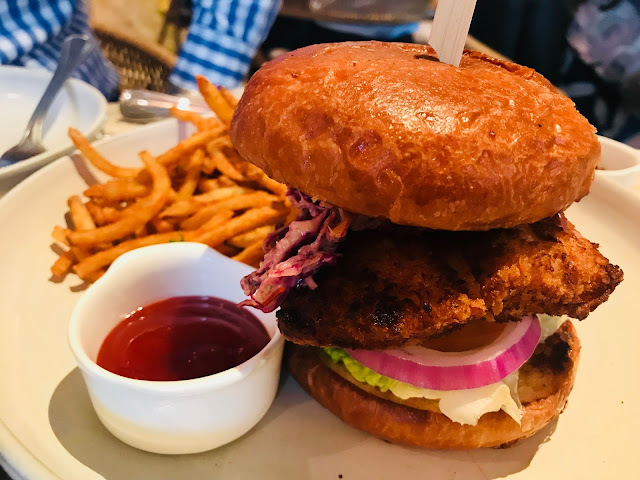 Did I tell you that I have fallen head over heels for South Beach Avenue, the newish lifestyle enclave in the Civic District that is home to 16 dining, beauty and entertainment outlets? 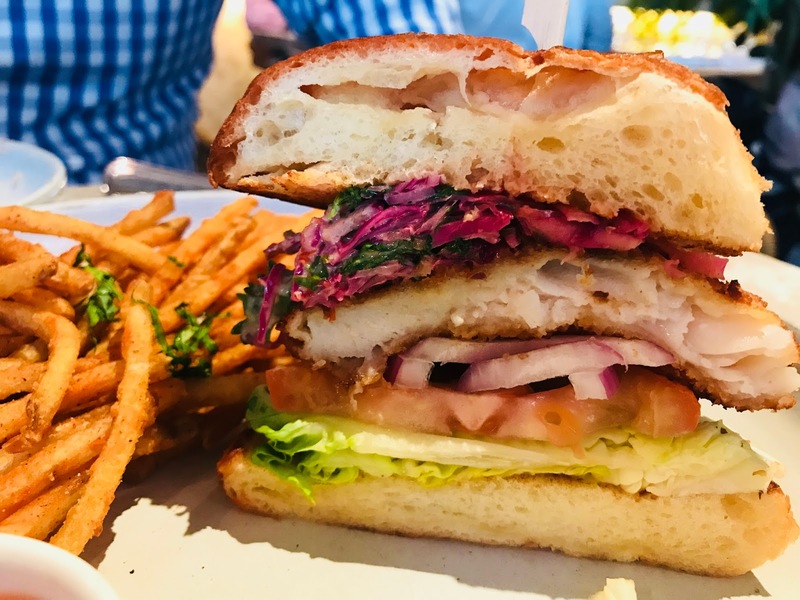 After having tried the delicious contemporary fusion pastas at Fasta, I decided to look around to see what other dining options South Beach Avenue has to offer. That’s when I spotted Fynn’s, a modern casual Australian restaurant. 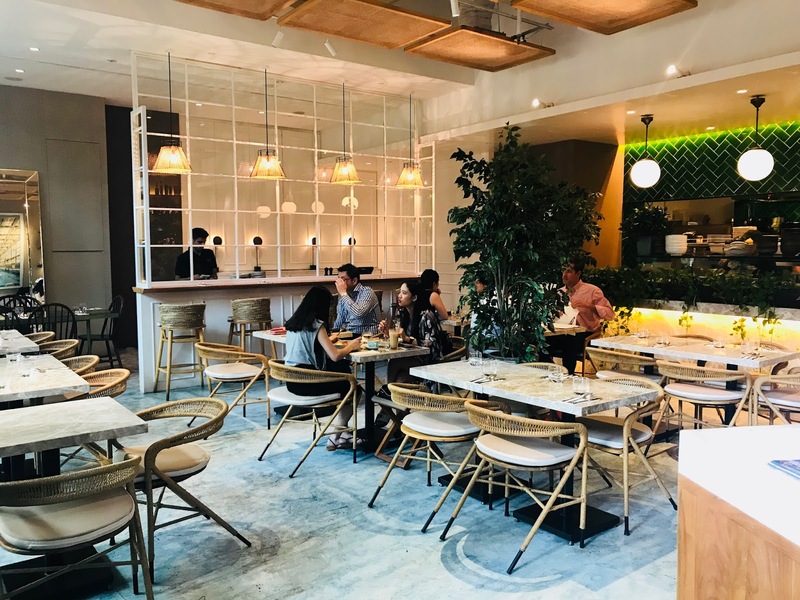 Ceiling-to-floor glass panels give customers a glimpse into the interior of the restaurant, while the outdoor alfresco dining area holds wooden tables and chairs gives it a laidback feel. 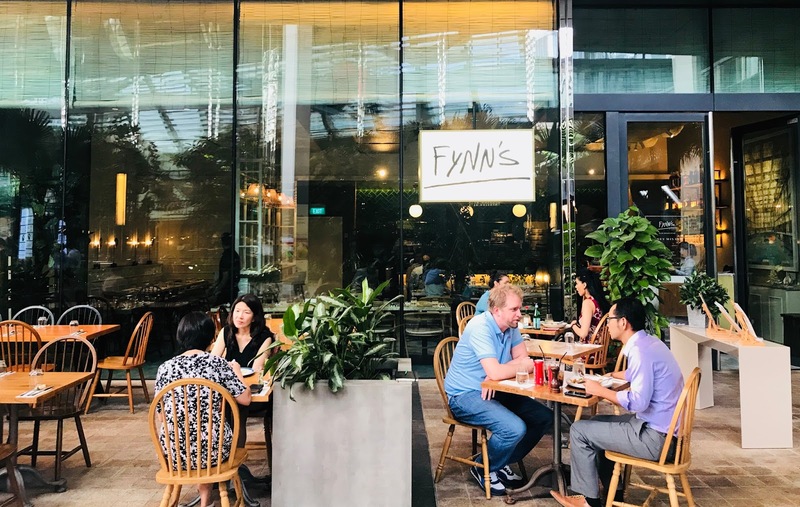 Marble flooring and tables gives Fynn’s interior an understated elegance while the warm fluorescent lights that hang from the ceiling gives the place a touch of coziness. 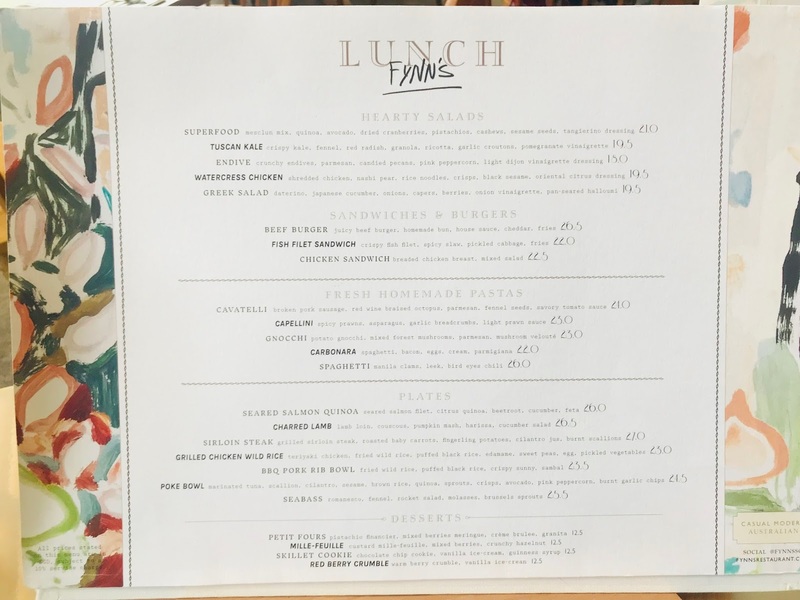 Fynn’s is a popular lunch spot among office workers in the area, as evidenced by the extensive lunch menu. 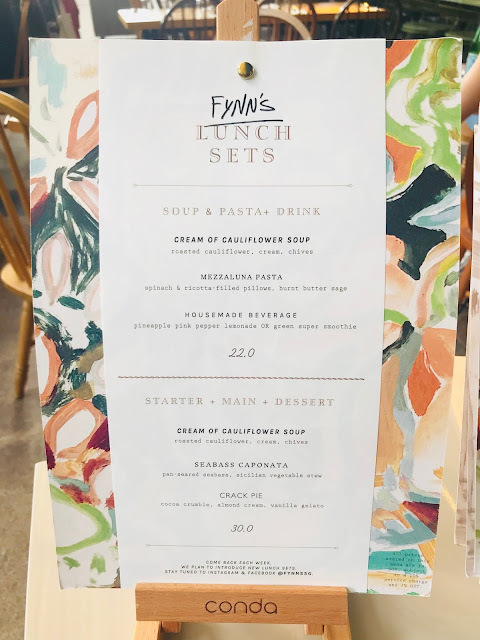 Those who are lazy to pick your meal can opt for one of Fynn’s Lunch Sets priced $22-30. It is not easy finding good lamb dishes in Singapore, so when I saw Charred Lamb [$26.50] on the menu, I ordered it without hesitation. 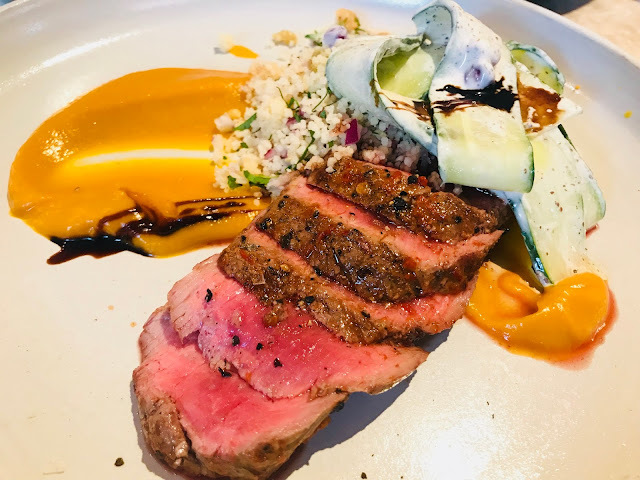 The perfectly grilled lamb loin is served sliced for easy eating, accompied by couscous, pumpkin mash, harissa hot chili pepper paste and a refreshing sourish cucumber salad. 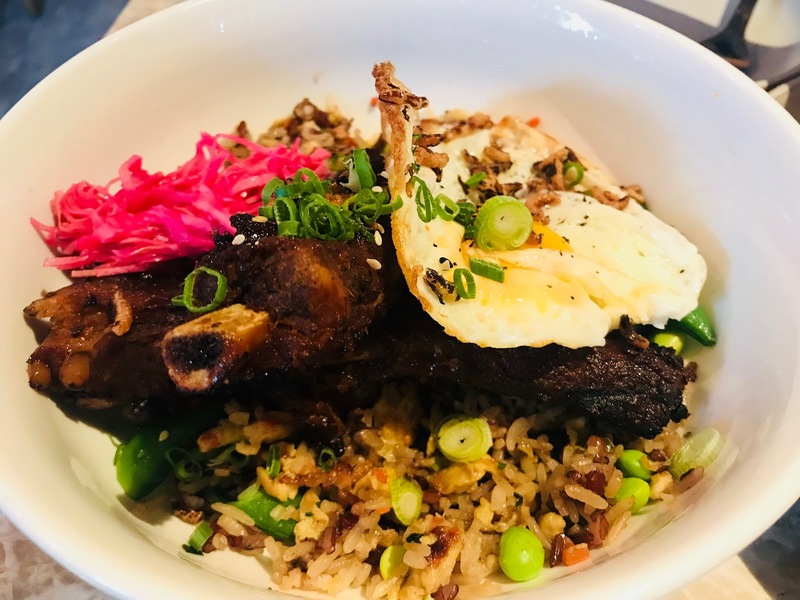 This BBQ Pork Rib Bowl [$23.50] is so good, I would order it again anytime. 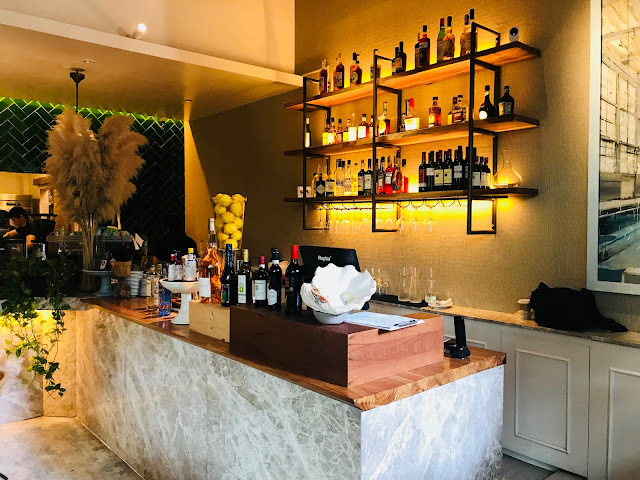 The pork ribs has been marinated for many hours, the marinated has gone right into the meat. Wild rice is fried with puffed black rice and served with a fried egg and sambal chilli that is more sweet than spicy. Fish Fillet Sandwich [$22] is like the super premium version of McDonald’s Fillet-O-Fish, where the crispy fish fillet is sandwiched between two fluffy hamburger buns together with spicy slaw and pickled cabbage. 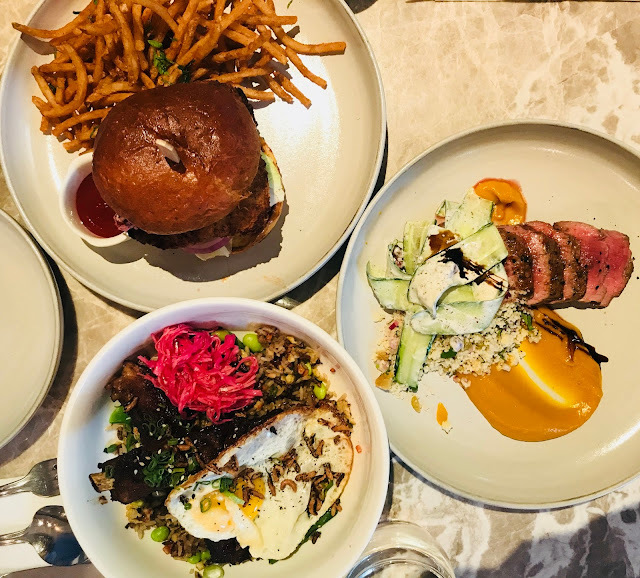 The accompanying shoestring fries is one of the best that I have had in a while. Fynn’s dinner menu features starters such as Endive Salad and Spanish Octopus, while the mains are fresh homemade pastas and meats (seared or grilled). Indulge in a luxurious weekend brunch of savory and sweet dishes from homemade corn fritters and fluffy vanilla pancakes, accompanied by a cup of Commmon Man Roasters speciality coffee.